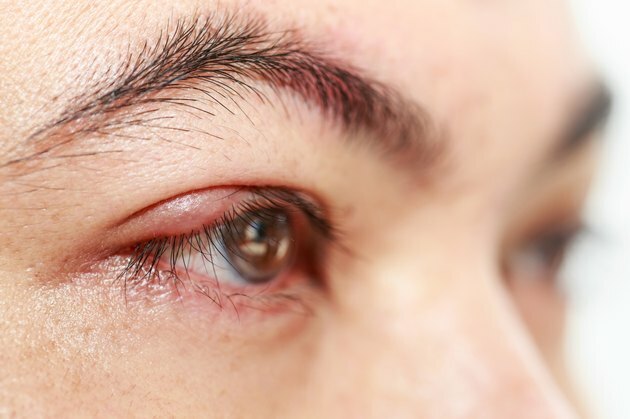 A sty, also called a hordeolum, often looks like a pimple or boil near the edge of your eyelid, explains the Mayo Clinic. Usually, styes form on the outer part of your eyelid, though they can also develop on the inside. Most styes dry up and disappear on their own within a week, but you can help encourage the healing process and relieve pain and irritation at home. Refrain from touching styes in your eyelids. Touching or squeezing the sty can cause further eye irritation and slow the healing process, explains the Mayo Clnic. Soak a washcloth in warm water and squeeze out the excess water to create a warm compress. Close your eye and place the washcloth over your eye, rewetting it as necessary when it loses heat. Keep the washcloth over your eye for 10 minutes and repeat the process four times a day to encourage the sty to drain, recommends MedlinePlus, a service of the National Institutes of Health. Wash your eye gently daily and do not apply makeup or cosmetic creams to the affected eye until your sty is gone. Wear glasses instead of contact lenses if possible. An eyelid sty can contaminate your lenses with bacteria, explains the Mayo Clinic. Talk to your doctor about prescription antibiotic creams or eyedrops if your sty does not heal on its own. In rare cases, your doctor may have to perform a minor surgical procedure to drain a pus-filled sty to relieve pressure, according to the Mayo Clinic. Make an appointment with your doctor if your sty causes vision problems or bleeds. If a sty does not improve within a week or two it may be a different kind of eyelid bump that your doctor can examine and diagnose.